Initiated in 2006, this website began as a supplement to the course “Israeli and Palestinian Literatures,” both as a resource of links to a variety of viewpoints on the history and literature of the Israeli and Palestinian peoples, and as an archive of interviews and projects by John Carroll students. It now supports new courses on peacebuilding and postcolonial literature. The goals: to track the personal and national narratives of these two peoples, whose conflict is neither eternal nor inevitable, and to provide the impetus for readers to be part of a solution to the conflict. 1. How is narration itself—the ability to speak one’s story on one’s behalf—complicated by the problem of war, terrorism or military occupation? 2. How do these narratives frame our understanding not simply of an individual’s subjectivity, but also of a national subjectivity? How have they shifted over time? 3. How do these narratives complicate how “the Arab,” “the Jew,” “the Palestinian,” “the Israeli,” etc., have been represented in U.S. mass media? In other words, what does this literature teach us that American mass media representations have not? 4. What sorts of answers to the present Israeli-Palestinian conflict does this literature provide? The following final projects–interviews, media analyses, and creative projects–reflect a diversity of student viewpoints and analyses on representations and narratives of the Israeli/Palestinian conflict. Please note: these projects do not represent the perspectives of the professor; they demonstrate the students’ struggle to make sense of the very different ways in which the story of the conflict is told. As such, as with all the links on this page, readers must consider each piece partial (sometimes in both senses of the term), and must determine their validity themselves. 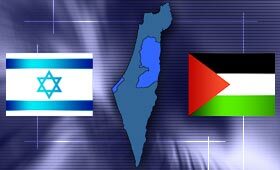 Wikipedia.org: A brief history of the Israeli/Palestinian conflict. BBC: A history of the Israeli/Palestinian conflict with maps. Ha’aretz Daily: A left-leaning Israeli newspaper. The Jerusalem Post: A right-leaning Israeli newspaper. Ynet news: The English version of Israel’s leading online news site. The Palestine Chronicle: An online newspaper that focuses on Palestine. MEMRI (Middle East Media Resarch Institute): pro-Israel, right wing think tank. MERIP (Middle East Research and Information Project): pro-Palestine, left wing think tank. Tikkun.org: A progressive Jewish-American magazine, founded by Michael Lerner, with a pro-Israel, pro-Palestine platform. WRMEA (Washington Report on Middle East Affairs): An alternative media analysis with a pro-Arab viewpoint. Cleveland Jewish News: local newspaper with Jewish perspectives. Arab American National Museum: national museum of Arab American history and culture. Maltz Museum of Jewish Heritage: local museum of Jewish American history and culture. http://en.wikipedia.org/wiki/Anti-Semitism: The history of virulent hatred against the Jewish people over the centuries. “Planet of the Arabs” video: Shows the Orientalist vilification of Arabs in American movies and television shows. FAIR (Fairness and Accuracy In Reporting): Media analysis with a leftist viewpoint. American Israel Public Affairs Committee: largest pro-Israel lobby in the U.S.
Christians United for Israel: pro-Zionist Christian organization. Anti-Defamation League (ADL): U.S. organization fighting anti-Semitism and bigotry. Arab American Anti-Discrimination Committee (ADC): U.S. organization fighting bigotry. If Americans Knew: Highlights Palestinian and Israeli issues that are unreported, underreported, or misreported in the American media. Pro-Palestinian. Pamela Geller: Right-wing, pro-Israel activist. Peace Now: A group that focuses on peace between Israel and its neighbors. Breaking the Silence: An organization of discharged Israeli soldiers committed to informing the public of the injustices committed in the Occupied Territories. Jewish Voice for Peace: A progressive community of activists inspired by the Jewish tradition to work together for peace and justice between Israelis and Palestinians. The Electronic Intifada: Publishes news, commentary, analysis, and reference material about the Israeli/Palestinian conflict from a Palestinian point of view. Israeli Literature: Israeli Literature entry in Wikipedia. Anna in the Middle East: Anna Baltzer’s work with International Women’s Peace Service led to her photographic documentation of life in the occupied territories.